The markets were quiet on Monday ahead of the inflation data due out on Tuesday. Earlier gains in the S&P500 and Dow Jones reversed with the indices closing slightly in the red whereas the Nasdaq was higher. The US dollar was weaker while commodity prices were generally softer. However, a pause in the indices was probably needed given the 3.5% rally in the S&P500 last week. The Dow Jones Industrial Average and the S&P500 declined 0.62% and 0.13% respectively, while the Nasdaq advanced 0.36%. The S&P500 continues to consolidate after February’s correction. A breakout and renewed push to the upside is probable in the months ahead. Headline inflation which will be reported on Tuesday is expected to come in around 2.2% in February while consensus estimates for core inflation are placed at 1.8%. The markets which were rattled by the inflation print in early February, will be watching the data closely. The yield on the 10 Year T bond has been effectively capped under 2.95% and is not only facing the inflation data this week, but has also had Treasury auctions to deal with. The US Treasury has auctioned around $21 billion in 10-year notes, along with $13 billion in 30-year bonds and $28 billion in 3-year notes, the most since 2014. 10-Year T bond yields have consolidated in recent weeks beneath the 2.95% level – see below. The inflation data due tomorrow will be closely watched and will likely provide the next impetus in terms of direction, as the markets normalise to the fact that rates are likely to go higher this year. The non-farm payrolls data out on Friday was strong but wage growth was relatively benign and this points to core inflation being also a ‘good number’ tomorrow. European shares rose in early trading, but fell back and were little changed by the end of Monday. The pan-European Stoxx 600 ticked up 0.25% for the day, while the Euro Stoxx 50 index of eurozone blue-chip stocks added 0.26%. Mining stocks lagged due to the tariffs imposed on steel and aluminium. Air traffic controller ENAV rose 2.3% in trading, while Heidelberg Cement ticked up 0.7%. ENAV, Heidelberg and Credit Suisse are held in the managed account portfolios. There was no major economic news out of Europe Monday. The FTSE 100 tapered gains earlier in the day to close marginally (-0.13%) lower Monday, with gold miners and engineering firm GKN weighing on the index. 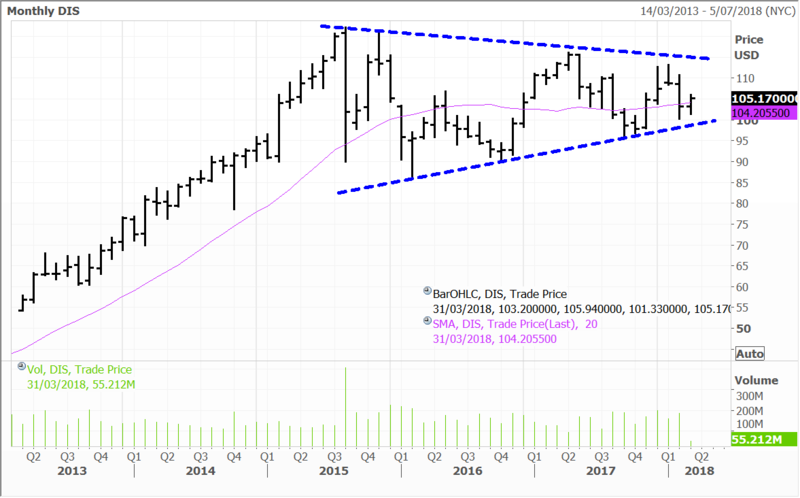 On a two-year weekly chart, the Nikkei has risen consistently within a trend channel since early 2016. 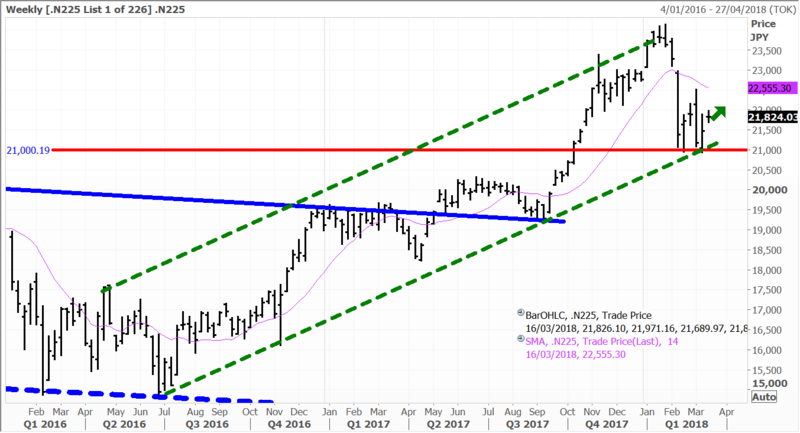 The correction that hit markets in early February proved to be deeper for the Nikkei after heavy resistance at the top of the channel brought on a swift correction with the index ‘testing the base” following a 15% sell off. 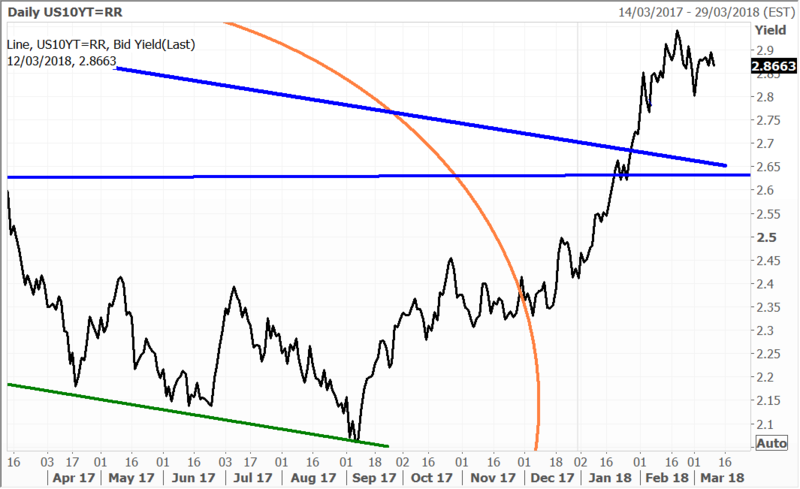 What was notable is that the Nikkei held important support levels whilst a battling a number of headwinds such as the stronger yen and political disruption. Foreign investors have significantly deleveraged in Japan, with capital outflows at record levels in recent weeks. This is positive and paves the way for the next upward leg in the Nikkei. 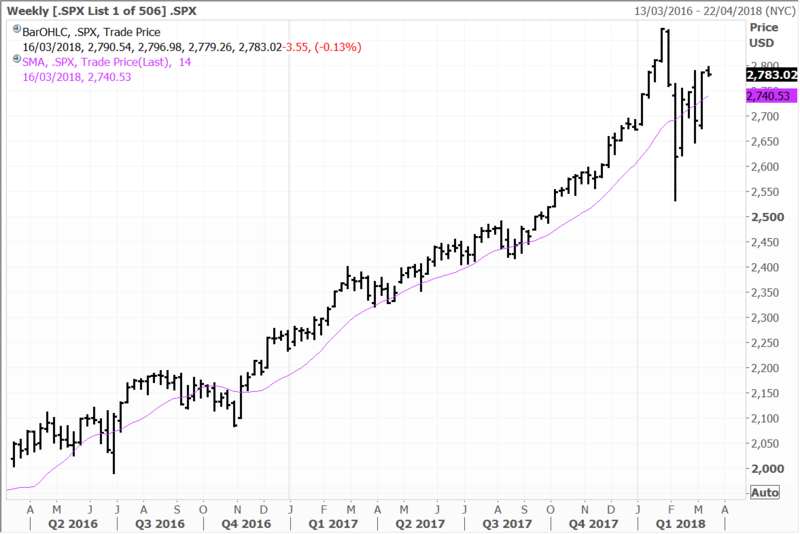 If the Nikkei can “hold the line” above 21,000, then that would be consistent with the upward trend remaining in place and provide targets back above 24,000 in the months ahead. Steel stocks recovered after selling off Friday, with Nippon Steel and Sumitomo Metal gaining 2.8%. Exporters also gained as the yen weakened against the US dollar. Robotics plans Yaskawa Electric and Fanuc advanced 2.7% and 4.1% respectively, while truck maker Hino Motors closed 2.5% higher. Energy company Inpex added 2.4% and the big banks Mizuho, Mitsubishi UFJ and Sumitomo all gained between 2% – 3%. Video game developer Square Enix slipped 3.1% in trading as a new job advertisement for its Final Fantasy VII remake was interpreted as indicating game development could be slower than some would like. Mizuho, Mitsubishu UFJ, Sumitomo, Fanuc and Inpex are held in the Global Contrarian Fund. Yaskawa and Square are holdings in the managed account portfolios. The Shanghai Composite advanced 0.59%, while the benchmark Hong Kong index surged 1.90% to a five-week high. The rally was led by financials as investors anticipate higher profitability from the sector in 2018. Insurers PICC and Ping An added 1.4% and 2.7% respectively. Oil and gas major CNOOC gained 2.7% and social networking giant Tencent Holdings closed 2.9% higher. The Macau casino operators were mixed in trading, with MGM China slipping 0.9%, Sands China up 2.5% and Wynn Macau surging 3.5%. CNOOC, MGM, Sands and Wynn Macau are held in the Global Contrarian Fund. Tencent, Ping An and PICC are holdings in the managed account portfolios. In Australia the broader market was on the up again on Monday but closed just shy of the 6,000 mark. The ASX200 rose 0.55% to finish at 5,996. The historically familiar resistance level has proven resilient, but I think a sustained push higher is only a matter of time. Particularly with resource stocks showing the way – BHP and Rio were both 2% higher yesterday – we are overweight both in the managed account portfolios. As I noted yesterday, there are strong thematic, as well as company specific, tailwinds in play. The onset of higher interest rates also underpins our positivity towards the insurance sector, as the benefits flow through further to investment income. We favour companies with low duration portfolios, and QBE remains a high conviction pick. We hold the shares in the Global Contrarian Fund, and the Global Opportunities, Concentrated Share and Income managed account portfolios. I have talked at length about the inherent value that exists in QBE, and the limited downside in the shares around current levels. On this note it was interesting to see that Morgan Stanley has come out with a sum of parts valuation on the insurer of $12.75 a share. I certainly concur that the shares are trading at a discount, and indeed I wrote last week why AXA’s move for XL has implications for QBE. The fact that AXA is also said to have run the rule over QBE is less relevant than the motivation for the deal. They can see the angle with investment income, but also premium growth, with inflation on the horizon, and also for the super catastrophe sector following the worst year for the industry on record. Sentiment towards QBE remains at a low ebb, but recent results and the blowout in the combined operating ratio are yesterday’s news. New CEO Pat Regan can also bring some positivity to the investment story, especially as it seems much ‘kitchen sinking’ has already been done, and as he looks to simplify and streamline the group. Indeed, the Latin American operations have already been sold for a reasonable price. 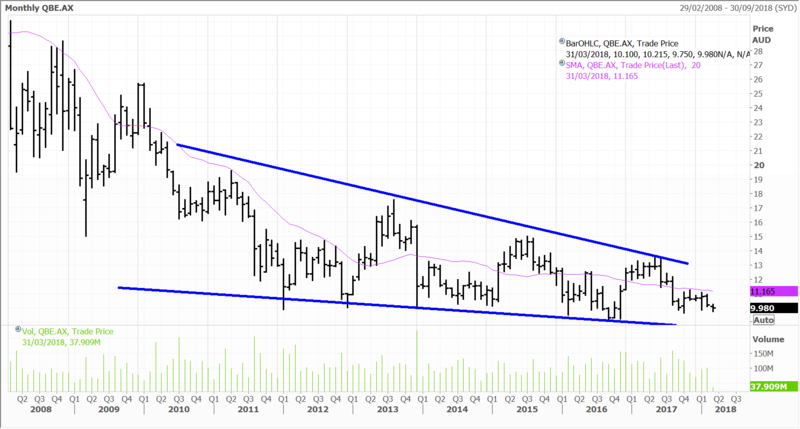 Our analyst team maintained a high conviction buy on QBE in last week’s report. Walt Disney topped the box office over the weekend. “Black Panther” kept up its record setting ways in North American theaters, easily brushing aside another Disney film, the newly released “A Wrinkle in Time”. It is now the first movie since “Star Wars: The Force Awakens” to top North American box offices for four consecutive weekends. “Black Panther” took in a projected $41.1 million over the weekend, that has lifted its domestic total to $562 million since the release four weeks ago. The film is now the seventh biggest domestic release ever. Meanwhile the ticket sales in China has increased its international takings to $516.6 million, taking its global total above the $1 billion mark. “When you think about having two films at the top of the box office, it’s definitely a win all around,” says Disney’s worldwide theatrical distribution president Dave Hollis. “We’re feeling good about this start … We’re feeling good about what, for us, is a little family competition between now and (the Easter holiday).” Disney’s share price was up 0.42% on Monday. Disney remains a core holding in the Contrarian Fund and is also held in the Global Opportunities managed account portfolio. In a couple of weeks, March 22 will mark 12 months since the IPO of our largest LIC, the Fat Prophets Global Contrarian Fund (FPC.AX). With the IPO we structured a unique option offering. All investors in the IPO received a 1 for 1 option with their shares. This means if they bought 10,000 shares in the IPO, they were also entitled to 10,000 options. The options allow the holder to acquire new shares in FPC at $1.10, any time between when they vest (on 22 March 2018) and over the following 12 months to 21 March 2019. The options were not transferable and were designed to reward investors who supported the IPO and who would be loyal holders of the LIC, investing for the long term gains we target. It is worth highlighting that any initial IPO investors who may have sold part or all their IPO stock will still be eligible to receive their loyalty options if they hold shares on the vesting date. For example, the initial investor with 10,000 shares who may have sold 5,000 of their shares will be entitled to 5,000 options on 22 March if they make no further sales or purchases. If the increase their holding back to their initial IPO investment of 10,000 shares by the vesting date they will be entitled to 10,000 options. If they increased their investment to 15,000 shares at the vesting, they would still only be eligible to receive 10,000 options, being the 1 for 1 rights based on the stock they acquired in the IPO. If IPO investors hold no shares, or less shares than they bought in the IPO at the vesting date, any ineligible options will lapse. Disclaimer: The Fat Prophets Global Contrarian Fund declares a holding in Heidelberg Cement, Mizuho, Mitsubishu UFJ, Sumitomo, Fanuc, Hino Motors, Inpex, PICC, CNOOC, Sands China, MGM China, Wynn Macau, BHP, QBE and Walt Disney.